A3 is hosting two migrant stork sculptures in public spaces around the building as part of Gavin Rogers latest project. 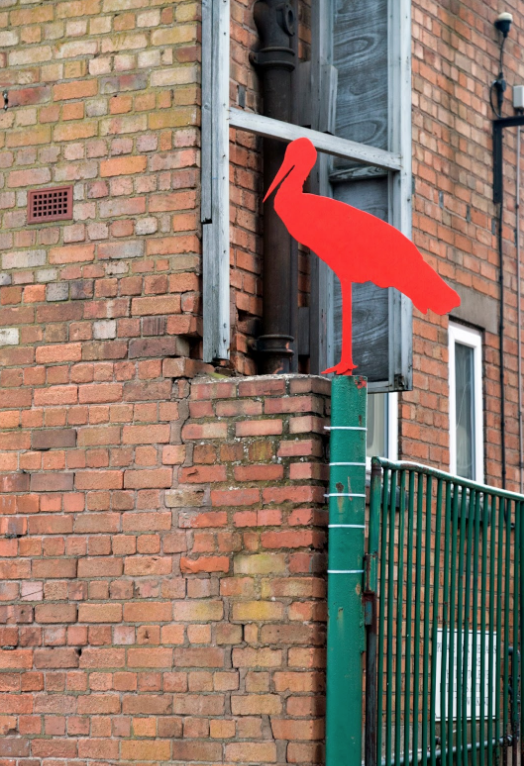 Between March and May 2018 a phalanx of red migrant stork sculptures are being installed across the West Midlands. The common stork migrates from the East African Savannah towards Southern, Central and Eastern Europe. Many people cross main land Europe welcome these multi-continental migrants each year - being the bearer of good luck, life, health and vitality. Once nested, pairs of storks will return for the same nest each year, for the rest of their life. Gavin is working closely with cultural venues, public spaces, schools and industrial workplaces - from galleries to builder’s merchants - to disseminate the story of the stork, and run related workshops and events. In the following spring (2019) the plan is to bring all of the storks together on a civic building to illustrate a weary phalanx of migrants looking across the region. Hopeful yet concerned, about whether they are welcome. An unusual yet delightful sight for passers by. The stork re-appropriated as a silhouette in multiples, has the potential to provoke many debates and conversations about belonging, nostalgia and migration for both for home and/or migrant citizens – something particularly important in recent political landscapes. To find out more about the project, including maps and sightings of the storks visit the Migrant Stork Website - there is also many associated images emerging through Gavin’s instagram (@gavin.rogers) and the hashtags #redstork #migrantstork. A3 Project Space is on the second floor of a Victorian canal-side warehouse and access is via stairs only. Unfortunately, we do not have the resources to install a lift, however, we can supply detailed information and images of our exhibition and events digitally.